A quiet but steady hemorrhaging of Iraq’s ancient Christian presence is underway and little is being done to stem the flow. Written threats, kidnappings, bombings and murder by Muslim extremists are driving thousands of Iraq’s minority Christian population out of their ancestral homeland, fleeing for safety to neighboring Jordan and Syria. Amman, Jordan, and Damascus, Syria, October 6 (Compass) — “The Christians are experiencing an absence of leadership,” explained Hala Hikmat, a recent arrival from Baghdad who has joined thousands of her countrymen in Syria. “We have no leaders who are communicating our urgent needs to the authorities, so consequently each person has to take care of themselves.” Their urgent needs, as expressed by Hikmat, are for protection and for a stand to be taken on Christians’ behalf. A string of church bombings in August and September sent anywhere from 30,000 to 40,000 Christians fleeing the country, according to estimates by Iraqi government and church officials. And they admit that hundreds more families out of Iraq’s 750,000 Christians are leaving each week. The United Nations High Commissioner for Refugees (UNHCR) disputes these figures, saying they are too high. But UNHCR offices in Amman and Damascus admit that it is hard to know exactly how many Iraqi Christians are currently in Jordan and Syria. Of the 4,000 Iraqi families officially registered as refugees with the agency in Damascus, more than half are Christians. It is believed that there are larger numbers of Iraqis in Syria because it is cheaper to live there than in Jordan. Iraqi Christians also said they have stronger cultural and spiritual ties to Syria. Syrian authorities estimate there are about 300,000 Iraqis in the country. “The Syrian government has been extremely generous to the Iraqis,” explained Abdelhamed El Ouali, UNHCR head in Damascus. “It has kept the borders open without political considerations. And it believes it has a sacred duty to allow Iraqis who need safety to stay as long as necessary. But I am afraid if the numbers continue to rise dramatically without any international assistance, the situation here could change,” he warned. A member of Iraq’s Chaldean Catholic community, who refused to give her name for fear of reprisals against family members, said she lived near one of the churches that was bombed in Baghdad last August. “I received a letter threatening me. It also claimed that the church where I served would explode while I was inside,” she said, “unless I paid $300,000. “We are poor people and do not have such money, so I took my husband and my son and we fled to Syria,” she said. The synchronized bombings of five churches on August 1 and a car bombing at a Baghdad church on September 10 sent shock waves through the Christian community. Iraqi officials blamed al-Qaeda ally and Jordanian terror-mastermind Abu Musab al-Zarqawi for the attacks. Most of Iraq’s Christians are Chaldean eastern-rite Catholics who are autonomous from Rome but who recognize the pope’s authority. 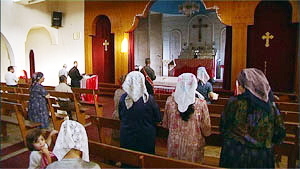 Other Christian denominations in Iraq include Roman and Syrian Catholics; Assyrians; Greek, Syrian and Armenian Orthodox; Presbyterians; Anglicans; and evangelicals. But the woman said that was not the main reason why her family fled Iraq. Her husband is a university professor. She explained that because he is a Christian and an educated professional, he was a double target for militants. “They have been killing university professors. They want to rid Iraq of intellectuals. Although Iraq’s top Shiite Muslim cleric, Grand Ayatollah Ali al-Sistani, has condemned the assaults on churches as “hideous crimes,” Muslim leaders have largely refused to criticize the killings of Christians who work for the U.S. military or sell liquor. Beauty salons and shops selling music cassettes run by Christians have also been targeted because they are deemed offensive to strict Islamic practices. Christian businessman Sawa Eissa said it was more than threats that forced him and his family out of Baghdad and over the border to Jordan. He said militants linked to renegade Shiite Muslim cleric Moqtada al-Sadr recently kidnapped and tortured him until his family paid ransom money. “A gang came to my shop with machine guns and forced me into a car where I remained for nine days,” he said. “They wanted $200,000 from me. Eissa, who is in his mid 50s, now walks with a cane and burn marks are visible on his body. He said he and his family hope to find permanent refuge in Australia because he cannot find legal work in Jordan. An Iraqi church leader, Noel Farman, said other Iraqis have also become victims of the escalating violence and militant clashes with U.S. and Iraqi forces. But because Christians are much fewer in number, he argued, attacks against them have a disproportionate impact. “Christians in Iraq are becoming more and more of a minority, and they are being sacrificed for the sake of the war against terrorism taking place on the battlefield of Iraq,” he said. “We feel depressed, because we are considered like a ‘playing card’ that outside forces can manipulate for their own aims. “We Iraqis of various religious and ethnic backgrounds are used to living together and enjoying good relationships, but now these relations are being exploited,” Farman explained, shaking his head. The number of Christians in Iraq is expected to drop as long as hostilities continue in the country, in line with their already steady decline over the past 15 years. Before the 2003 war, Christians represented one million out of Iraq’s 25 million inhabitants, while a 1987 census recorded their number as 1.4 million. A Syrian Orthodox bishop, preferring not to be named, said he feared Iraq’s Christian population could totally disappear within a decade if emigration continues at its current rate. But Farman was more hopeful. He said the Iraqi church was resilient and would move underground if the circumstances worsened. Yet even in these troubled times, there are stalwart Christians who are choosing not to leave their homeland. A small group of Pentecostal Christians who visited Amman recently from Baghdad reported that their church is growing, despite some outward pressure. In another instance, a family returned to the Iraqi capital in order to start a Bible study with women from one of the Catholic churches targeted in the August blasts. Iraqi Christians said they do not want to leave their country, but without the needed recognition and support of their rights, staying there is becoming a more difficult proposition.